We already knew that Republicans got 12 of OH’s 16 US House seats despite winning only 52% of total congressional vote. 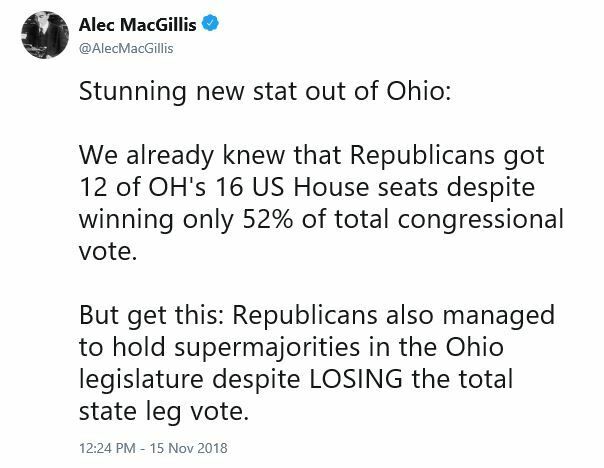 But get this: Republicans also managed to hold supermajorities in the Ohio legislature despite LOSING the total state leg vote. 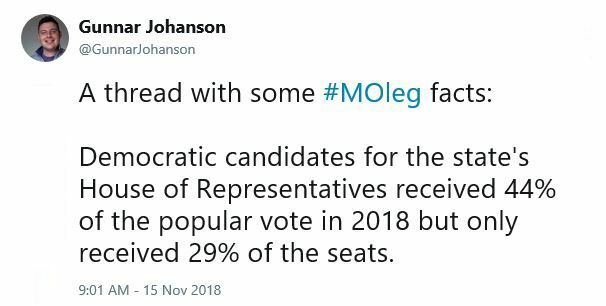 Democratic candidates for the state’s House of Representatives received 44% of the popular vote in 2018 but only received 29% of the seats. This is an increase of 10% of the electorate from 2016, yet only yielded one net seat gain from 2016 to 2018. Meanwhile, the GOP lost 8% of the state house electorate but only lost one seat. One seat is .6% of the chamber.